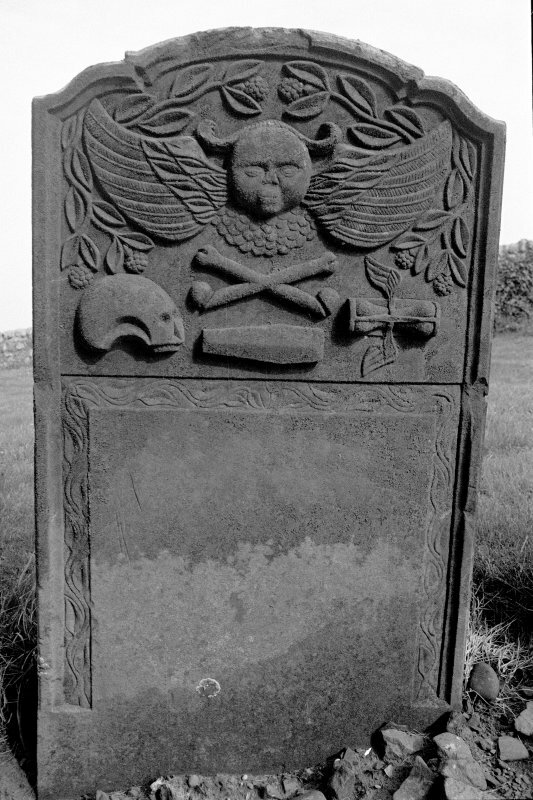 View of headstone to Isobel Mclunie d. 1769, Kirkmaiden Old Parish Church burial ground. 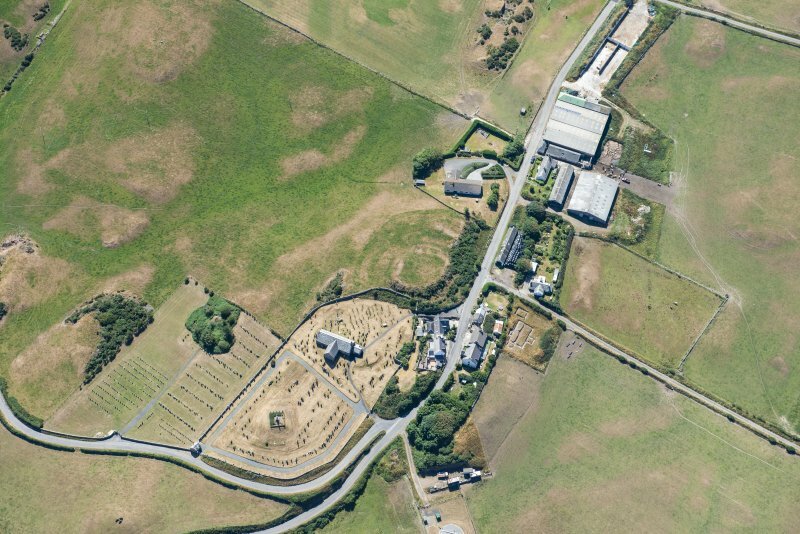 Oblique aerial view of Kirkmaiden Old Parish Church, taken from the E.
Oblique aerial view of Kirkmaiden Old Parish Church, taken from the SW.
Oblique aerial view of Kirkmaiden Old Parish Church, taken from the S.
Oblique aerial view of Kirkmaiden Old Parish Church, taken from the NE. 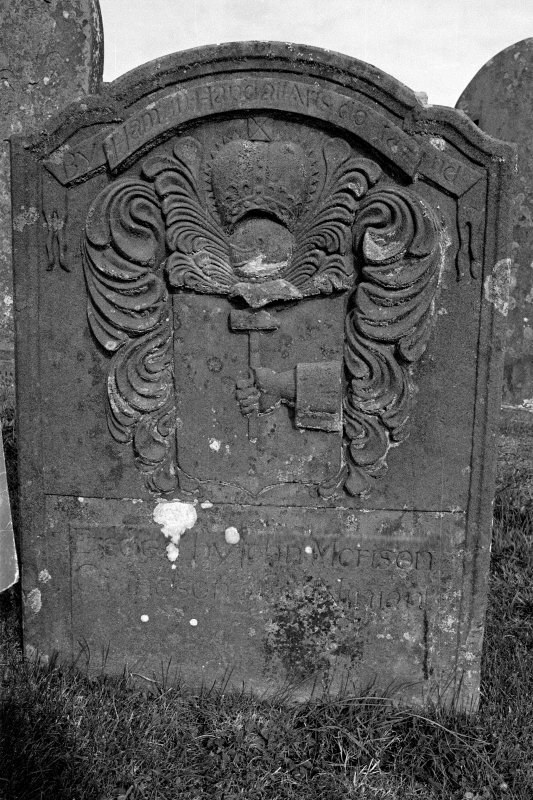 Gravestone commemorating Ninian Morison, d.1725. 'By Hammer in Hand all Arts do Stand'; royal crown, hand holding hammer. Gravestone commemorating Elizabeth McKittrick, d.1751. 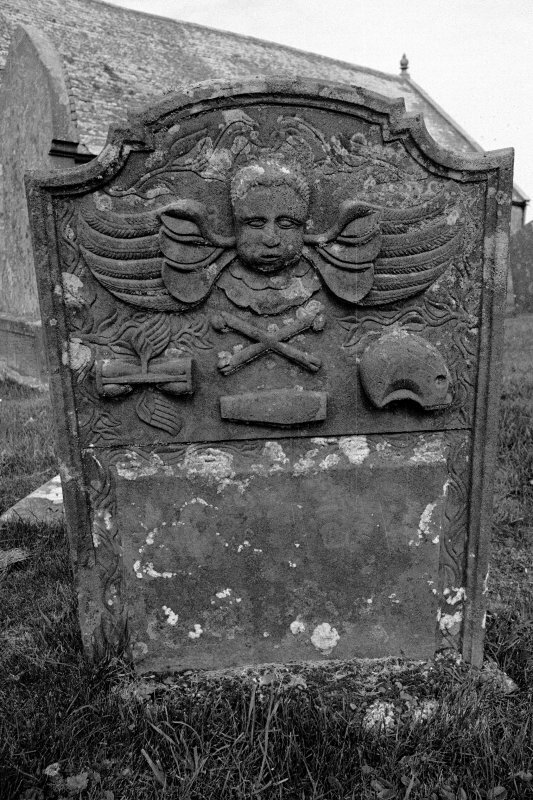 Winged cherub; skull in profile, crossbones, coffin, winged hourglass. 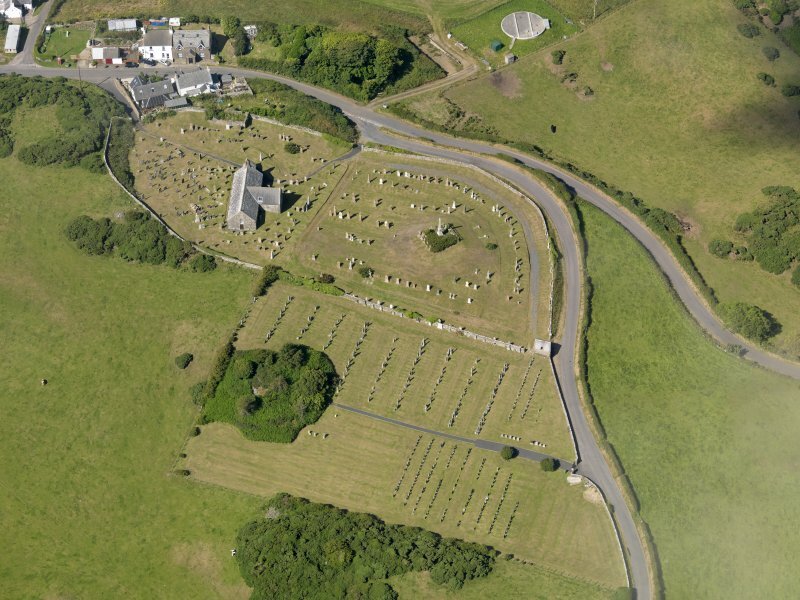 Oblique aerial view of Kirkmaiden Old Parish Church, taken from the ESE. Gravestone commemorating Isobel McLunie, d.1769. 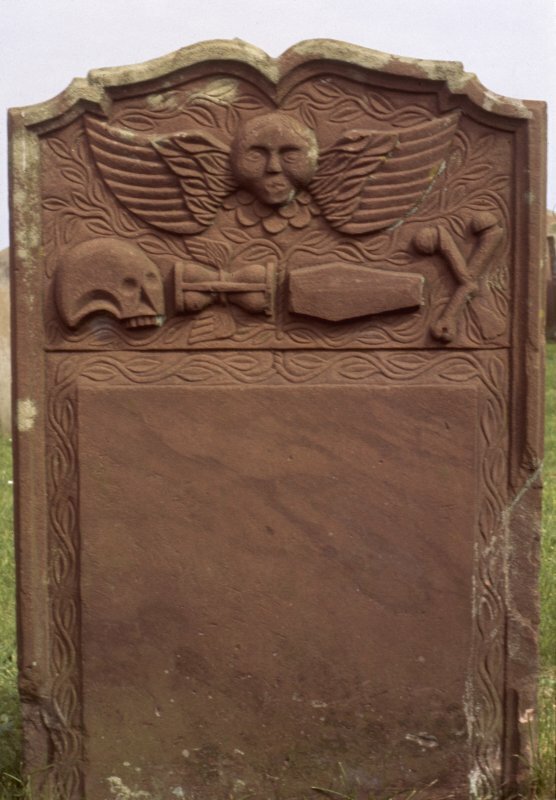 Winged cherub; skull in profile, coffin, winged hourglass, crossbones. 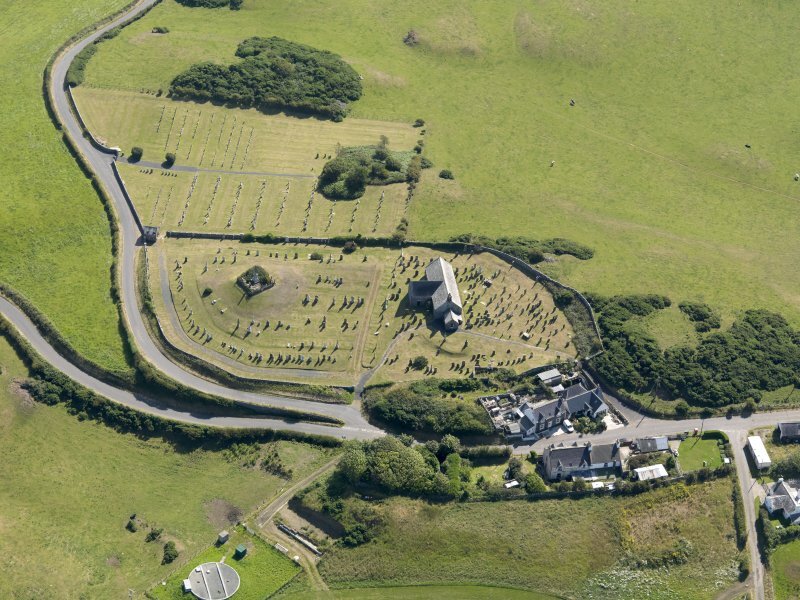 Oblique aerial view of Kirkmaiden Old Parish Church, taken from the WNW. Gravestone commemorating Ann Williamson, d.1780. 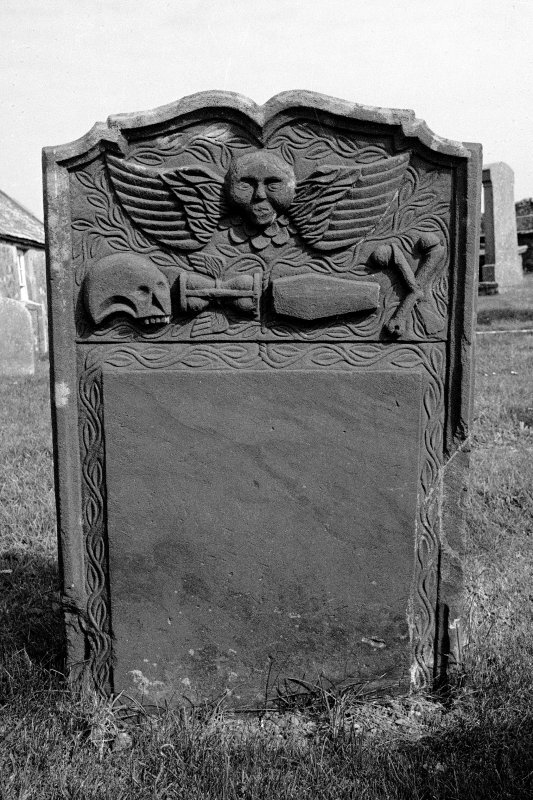 Winged cherub; winged hourglass, crossbones, coffin, skull in profile. 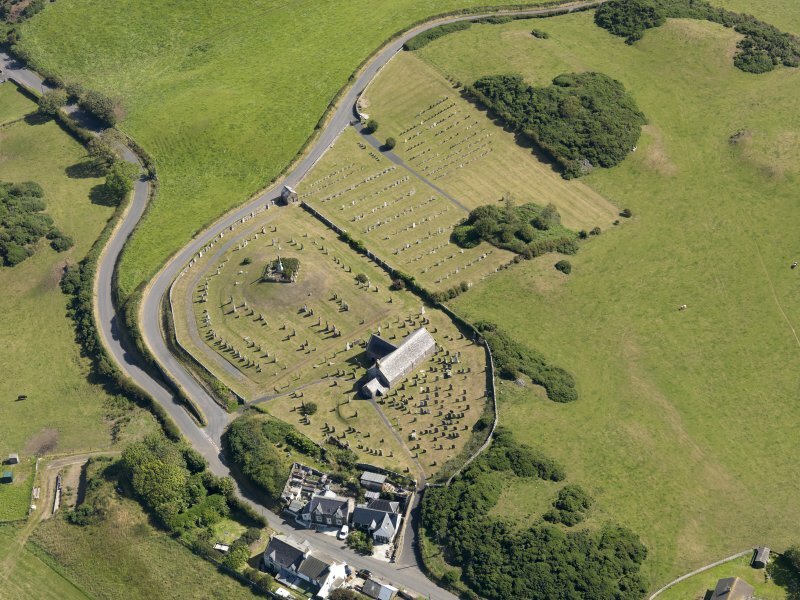 Oblique aerial view of Kirkmaiden Old Parish Church, taken from the NW. 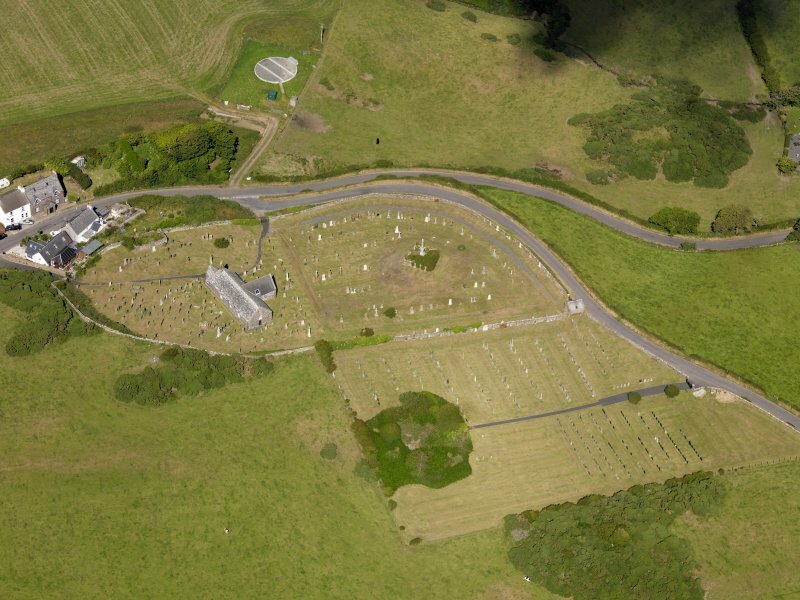 For (predecessor) Kirkmaiden Church (NX 13853 32437), see NX13SW 7. 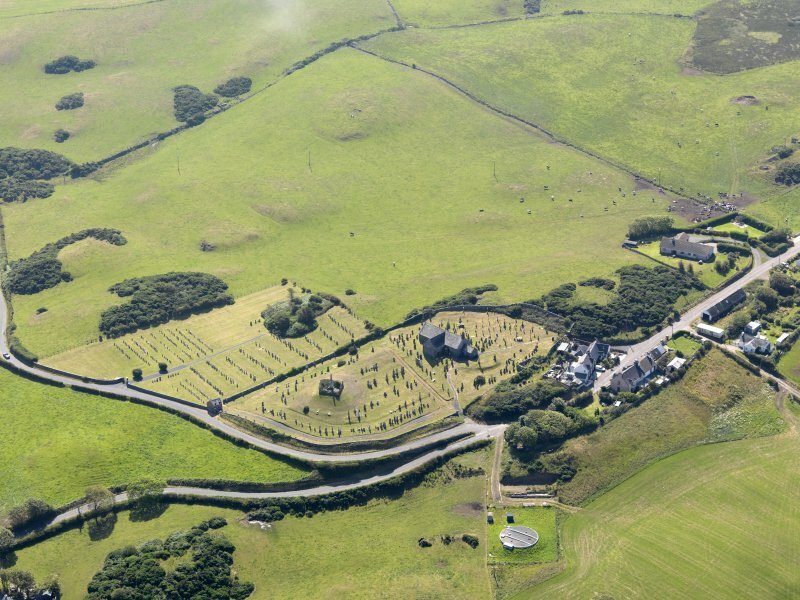 For successor and present Kirkmaiden Parish Church (NX 13466 36703), see NX13NW 57.00. The present parish church was built in 1638. 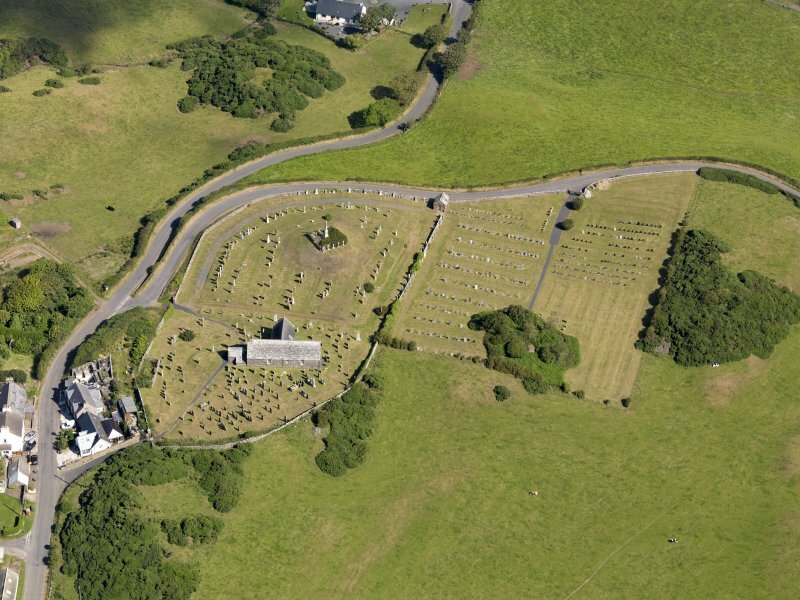 It is a very plain church with a modern belfry, and its N aisle contains the McDowall of Logan burial vault. (For earlier church, see NX13SW 7). 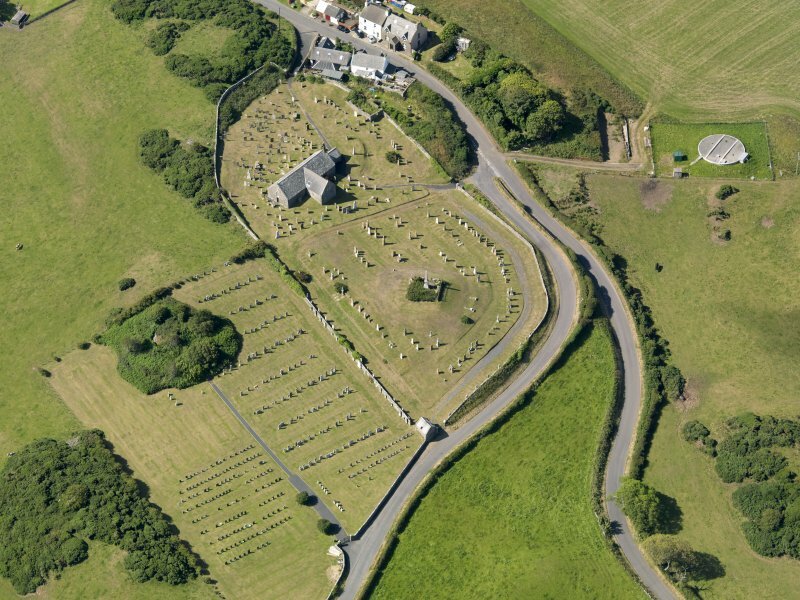 This T-plan church, built in 1639 to replace the former parish church at St Catherine's croft (NX13NW 7), stands within its walled burial-ground overlooking Kirkmaiden. 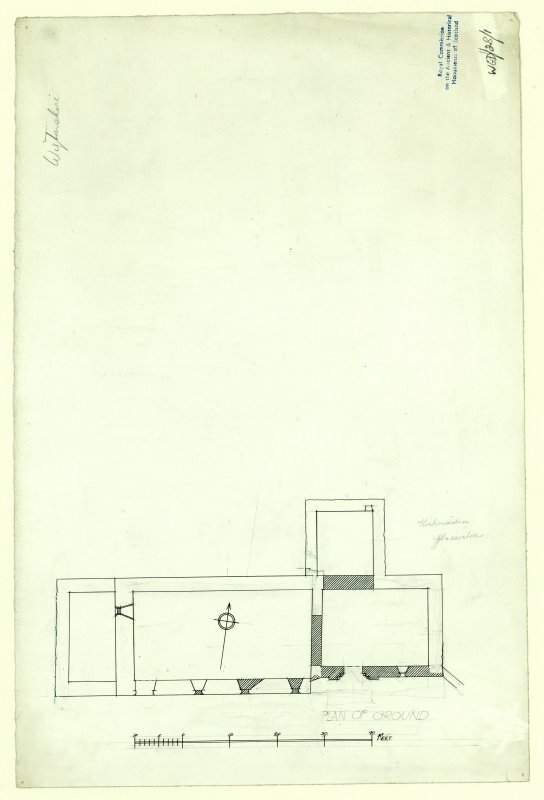 It comprises a rectangular nave (19.5m by 6.5m internally) with the burial-aisle of the McDoualls of Logan on the N. A bell, cast with the date 1534, and said to have come from Castle Clanyard (NX13NW 2), together with a triangular plaque bearing the arms of the Adairs of Kinhilt and the date 1618, are to be found inside the church. OSA 1791; NSA 1845; W M'llwraith 1877; G Chalmers 1887-94; RCAHMS 1912; H Scott 1915-61; RCAHMS 1985, visited June 1984.